To discuss Little Witch Academia without also mentioning how it came to be would be, at best, an oversight. At worst, it would do a great disservice for what at least part of its message would happen to be able to represent. While the fine folks over at the freshly founded Studio Trigger had a number of industry names under their belt (Masahiko Ohtsuka, Hiroyuki Imaishi, and Kazuya Masumoto, among others) from a mass exodus over at Gainax, getting a new studio off the ground is rather difficult work. Particularly financially, given the expenses and physical hours required in the production of animation. While they were able to do some short contract work for the likes of The Idolmaster and Project X Zone, as well as the aforementioned comedic web anime shorts of Inferno Cop, the Japanese government’s Agency of Cultural Affairs saw potential and approved their inclusion in the Young Animator Training Project for 2013. An initiative since 2010 to foster the development of new talents and maintain a definite space for the teaching of animation production techniques regardless of present or future industry outsourcing shenanigans, four studios are selected from an applicant pool each year for grant funding to each develop a short animated film that will involve a number of less experienced staff throughout various levels of their associated projects. In turn, these films are collected together for a combined series of theatrical showings under the common banner of Anime Mirai (meaning “the future”, so effectively “Anime of the Future”). 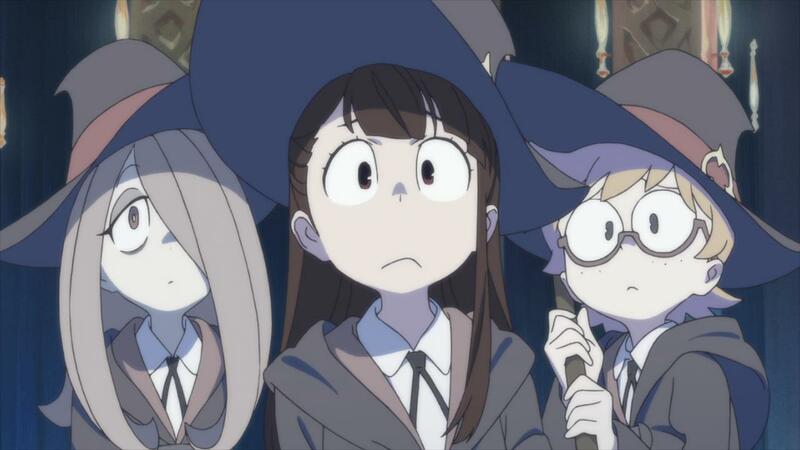 While they can vary dramatically in quality from short to short and year to year, in many respects Little Witch Academia has raised the global profile of the entire initiative due to its whirlwind viewership success. It is an incredibly fitting development arc for a production that is entirely about embracing ones most fantastical and magical of dreams, in both the narrative sense and the actual construction of the end product. 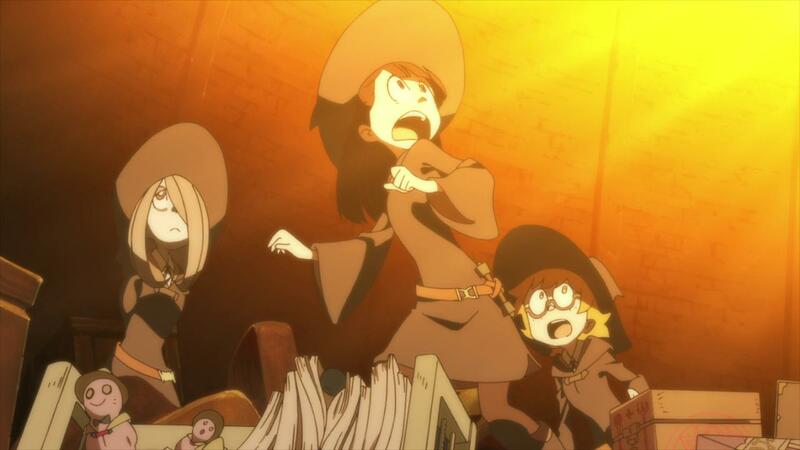 Visually speaking, as a work of labor, Little Witch Academia is nothing short of delightful. It has a fluidity and a sense of attention to physics detail more in line with eternally classic Tex Avery shorts and the like. Everything about it is motion, the way fabrics, capes, and hats flow about, how magic spells arc and dazzle and otherwise cause their various reactions. How characters will maneuver around each other in the framing, how they will toss or turn or creatures scamper about. One gets the feeling at least part of the reasoning for placing the short in a magical school theme was purely because things like swinging sorcerer wands around all willy nilly would be A Fun Thing To Draw. And It would be fun, like getting to make those exact kinds of older classic works full of vibrant senses of life and energetic detail that tends to really draw folks to getting into animation in the first place. It is the realization and reality of such dreams given the grace of physical form. The story of Akko Kagari is much like these wide eyed ideas given visual form and dialogue. As a small child, she is dazzled by the raw spectacle and creative delight of a magical theatre show performed by Shiny Chariot. She sees in those sparkling moments large stretches of so much unlimited potential, the boundless possibilities that exist in the world and where the particular format and skills of the magical arts would be able to take her. So we fast forward so many years, and she is enrolled at Luna Nova Academy, a school for educating and training young witches. 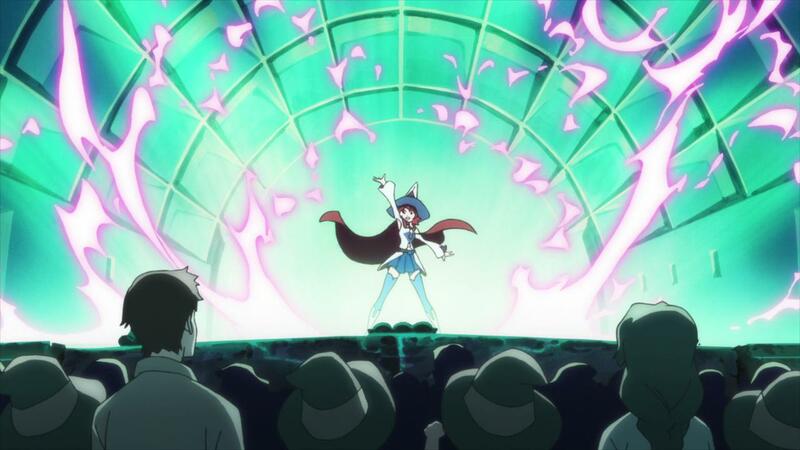 Akko herself has no inherent magical talent or skill, has great difficulties with the material, and is mocked by other students for admiring her inspirational idol figure as she does. Shiny Chariot is a child’s frivolity, they say. In a means much akin to those age old Looney Tunes shorts and how one would certainly be able to cite them as a great personal driving force for a certain life goal and yet receive scorn from the more “serious” folks, her ears perk up at their mention and attempt to match them, yet met with being repeatedly put down. In one case, literally falling down, as she fails to be able to make her broomstick fly and tumbles through the trees (itself a sequence that could have just as easily started Daffy Duck as Akko). Banged up and in bed, we see the Shiny Chariot poster on her little space of wall, and Akko still remarks to her friends about how great she thinks her idol is as a motivational force. And she still gets poked and prodded about how silly Chariot seems to the others, how she spreads the wrong ideas about witches and her magic is lame. It is certainly a discouraging set of affairs to be in on the the one level, and doubly certainly is it a kind of goal and career narrative that resonates quite deeply with a number of the members taken on board for the parameters of the Young Animator Training Project. The idea of loving a thing so very much that you want to join those ranks, and soldiering on despite everyone saying how silly the whole thing is. The storyline certainly does more than this of course, and as an overall narrative, Little Witch Academia is rather airtight. Which is to say, it is a simple story done well. It possesses a cleanly defined beginning, middle, and end for how its arc progresses over the half hour or so it lasts. The plot does not necessarily surprise, but it would rather be a solid short story chapter over leaving weirdly hanging threads all over the place. And I respect that enormously, at being able to achieve the level of detail necessary to tell the story one wishes to share, but with keen editing of any sort of extraneous tangents or the like. At the same time, needing to ensure there is not so little world construction or characterization that one has no grounding in what is going on or why. It is a very difficult line to actually walk, and short film can be treacherous art waters for even highly skilled professionals. In several ways, as a piece of animated media, Little Witch Academia reminded me on both a past and present level of why I watch as much animation as I actually do. It is with that sense of warmth and supreme trust in being able to actually have fun with ones chosen dream that is at the very core of how so many internet commenter fields exclaim the folks at Trigger will somehow “save anime” in the future years to come. Hyperbole or not as those various remarks on so many different forums and the like may turn out to actually be down the road, the short was good. Great. Grand. Fun Times With Cartoons. We all do well to have reminders of that each and every year in the industry, regardless of age, be we merely consumers or those future animators who have yet to be.